Personal rapid transit is a developing form of sustainable transport that could significantly alter urban mobility. Photo via Treehugger.com. Sustainable urban mobility can come from multiple sources. Personal rapid transit (PRT) combines public transport with personalized routing. Though their designs vary, PRT systems generally consist of four- to six-passenger pods that are autonomously controlled while traveling along guide-ways. Instead of running on a schedule, the pods could be used on demand to take passengers directly to their destination. Proposed PRT systems aim to reduce traffic congestion, minimize air pollution, and support faster, more convenient transport in urban areas. Though the concept has been around for 50 years, research and development of PRT has surged in the past decade. The first quasi-PRT system, introduced in Morgantown, United States in 1978, carries students and faculty across the West Virginia University campus in 20-person cars. 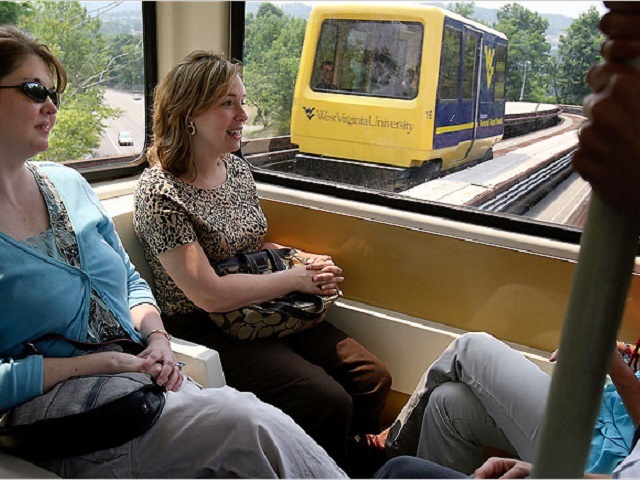 The Morgantown PRT system covers 8.7 miles, and carries about 15,000 passengers per day during fall and spring semesters. One estimate suggests that Morgantown’s PRT system provides faster transport with lower operating costs than bus service. A number of proposed and operational PRT systems have emerged in the past decade. 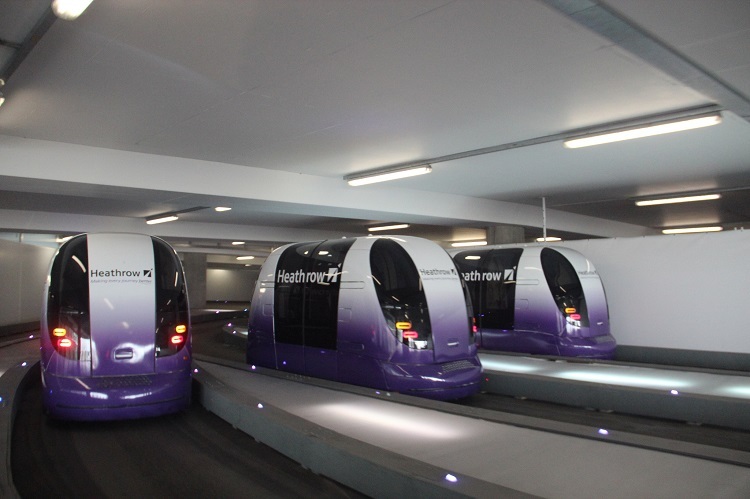 Ultra’s PRT system in Heathrow International Airport uses 21 pods, and recently completed its one millionth autonomously driven mile. Still, the system is limited to one guide-way and three stations. The Vectus system in Suncheon Bay, South Korea is nearing operation, though it will only have two stations over a 4.6 km (2.8 miles) track. Heathrow’s PRT system travels 3.8 km (2.3 miles) and has carried over 700,000 passengers. Photo by Wilson Loo Kok Wee/Flickr. More ambitious plans see PRT as a way to help replace cars. Masdar City, United Arab Emirates – a planned city that aims to be a model for sustainable urban development – has proposed a mix of group rapid transit (GRT), PRT, light rail, and metro lines. GRT is a similar concept to PRT with greater capacity. Masdar City’s goal is to ensure that no point in the city is more than 300 meters from public transport. Princeton University recently released a report proposing a PRT system throughout New Jersey capable of replacing 90% of cars. The report estimates that a 9,000 station system would require 20 years and US$110 billion to build, about five times the cost of Boston’s Big Dig freeway rerouting project. MISTER (Metropolitan Individual System of Transportation on an Elevated Rail) is a PRT system prototyped in 2007 that would suspend “intelligent gondolas” in mid-air rather than running on tracks. Similar to Bolivia’s recently opened cable car system, MISTER could complement existing transport systems. The cable car system, which connects the high altitude cities of El Alto and La Paz, is expected to save users 15 to 40 minutes per trip as compared to the bus system that travels between similar destinations. MISTER could avoid significantly disrupting existing infrastructure by using suspended tracks. Image via Kubik-Rubik.de/Mister-er.com. MISTER vehicles would be electrically powered, and could dramatically reduce travel time if they are able travel the proposed 50 km per hour (31 mph). MISTER also aims to have a capacity between 5,000 and 10,000 passengers per direction per hour. Though the idea is far from implementation, it has received promising support. According to its website, MISTER received a US$10 million High Technology Grant from the European Union, pending a matching investment. Can PRT achieve its potential? While a successful PRT system could support compact, sustainable development and mobility, significant challenges remain before they can significantly alter urban mobility in developed or developing cities. The government in Gurgaon, India has explored using PRT “pod taxis” to supplement existing mass transport infrastructure for the past four years, but has seen little progress. A similar project in Amritsar, India has also stalled due to political and technological challenges. It remains to be seen whether PRT can be appropriate for dense developing cities, given that capacity may be too small to meet transport demand. PRT systems may someday help cities wean off car-culture and support compact development. Still, these and other proposed PRT projects face major hurdles, and have yet to prove their advantages over existing sustainable transport options like metro and bus rapid transit (BRT). Alternatively, Helsinki has announced a plan to make car ownership obsolete through a “mobility on demand” system that would mix a variety of public and private transport systems to deliver transport anywhere in the city. Instead of focusing on developing new technology, Helsinki aims to integrate existing transport options more intelligently. Despite the challenges facing PRT, the growth of innovative transport plans suggests that the future of urban transport may not include cars.